Leading off today: There wasn't much doubt that the Ossining girls basketball team would be the one to beat in Class AA of the NYSPHSAA this season once the Pride got healthy. The real issue was whether they would ever get fully healthy. They're still not 100 percent in that respect, but it was a moot point within a matter of minutes Sunday as Ossining blew through West Genesee 93-46 at Hudson Valley Community College for its fifth state championship. Ossining was playing in its seventh consecutive title game but shad lost in the final the past two seasons. Aubrey Griffin, playing with a tender knee, put together 35 points, 16 rebounds, seven assists and three steals in the final. She finished the New York State Public High School Athletic Association tournament with 146 points, breaking the 2013 record of 133 by Ossining's Saniya Chong. Jaida Strippoli chipped in with 17 points for Ossining, which ended the first quarter on a 15-0 run for a 25-4 lead. The victory was No. 499 for Pride coach Dan Ricci. Girls Class A: Pittsford Mendon captured its first championship by fighting off Binghamton Seton Catholic 59-50. "We did the unthinkable," Mendon senior Alana Fursman said after finishing with 21 points. "Honestly, I knew we were going to get here, but it feels so unreal." Sophomore Lexi Green chipped in with 10 points and 11 rebounds. Boys Class C: Jack Lambert scored 24 points and John Kennedy for Cooperstown in a 71-61 win over Middle Early College, giving the Hawkeyes their first state championship. Kennedy, a 6-foot-8 sophomore, also had 13 rebounds. Lambert's 76 points and 29 field goals in the two weekend games broke records set 36 earlier by Devin "Press" Murphy of Charlotte. Kennedy's 35 rebounds in the final four were five shy of Christian Laettner's 40 for Nichols in 1986. "I've literally dreamed of this forever," Lambert said. "This is just so amazing. Just to bring it back to the community, to our team. ... Just to do this for all of the guys that played before us." Boys Class D: Harrisville, making its first trip to the final since 2002, steadily pulled away to a 67-54 win over Oppenheim-Ephratah-St. Johnsville in its first title-game appearance since 2002. Peyton Schmitt finished with a team-high 26 points for Harrisville, which lost in the semifinals the previous two seasons. Following up: Lost in the excitement of Saturday's victory over Lowville in the boys Class B championship game was the fact that the Indians became the second team to win NYSPHSAA championships in football and basketball in the same academic year. Aquinas was the first to achieve the feat in 2015-16. More from the weekend: The three-day attendance in Binghamton was a robust 14,567. Much of that can be attributed to fans wanting to get a glimpse of JG3, but it was obvious that teams like Lowville traveled well, too. Coming up: The Federation tournament committee released a schedule for the upcoming weekend in Glens Falls last night, but times are going to be adjusted and announced Monday afternoon. 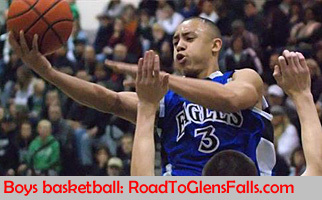 Organizers are going to break the Saturday schedule of seven games into two sessions requiring separate admissions because of the insane interest in the event created by the presence of the Glens Falls team and all-time leading New York scorer Joe Girard III. More than 2,000 tickets had already been sold by 10 a.m. Monday. Organizers are concerned that the Glens Falls crowd will show up long before the scheduled tipoff, in essence selling out the arena before fans of other teams playing the early games can arrive and get in. Splitting it into two sessions will alleviate the crush.